Specialist load cell cable is a must if you want to keep your system working at its optimum level, always insist on quality PT load cell cable. We have a range of load cell packs to suit most situations, from small 10metre packs to large 1000metre rolls. Don't forget when joining cable to use our standard jointing kit (instructions included) this kit will join all sizes of our load cell cable. PT provides a range of convenient cable packs idealy suited to extension of load cell cables or connection connection of junction boxes, indicators, conditioners, etc. and transfer of signals for remote displays or analogue signals. All cables are screened with flexible multi stranded conductors. Jackets and diameters vary to suit the application. 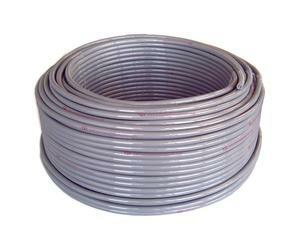 4 core cable can be used for 4 core load cells or general signal transmission. 6 core cables are suited to 6 core load cells, extension of 4 core load cells and connection to indicators where use of sense wires is desired to ensure there is no loss in accuracy that can be observed when the length of 4 core load cell cables is changed.